Albert Einstein (March 14, 1879 – April 18, 1955) was a German-born Jewish theoretical physicist of profound genius, who is widely regarded as the greatest scientist of the 20th century and one of the greatest scientists of all time. The undisputed "father of modern physics," he proposed the theory of relativity and also made major contributions to the development of quantum mechanics, statistical mechanics, and cosmology. He was awarded the 1921 Nobel Prize for Physics for his explanation of the photoelectric effect in 1905 (his "miracle year") and "for his services to Theoretical Physics." After his general theory of relativity was formulated in November 1915, Einstein became world famous, an unusual achievement for a scientist. In his later years, his fame exceeded that of any other scientist in history. In popular culture, his name has become synonymous with great intelligence and even genius. Einstein himself was deeply concerned with the social impact of scientific discovery. His reverence for all creation, his belief in the grandeur, beauty, and sublimity of the universe (the primary source of inspiration in science), his awe for the scheme that is manifested in the material universe—all of these show through in his work and philosophy. Einstein was born at Ulm in Baden-Württemberg, Germany, about 100 km east of Stuttgart. His parents were Hermann Einstein, a featherbed salesman who later ran an electrochemical works, and Pauline, whose maiden name was Koch. They were married in Stuttgart-Bad Cannstatt. The family was Jewish (non-observant); Albert attended a Catholic elementary school and, at the insistence of his mother, was given violin lessons. At age five, his father showed him a pocket compass, and Einstein realized that something in "empty" space acted upon the needle; he would later describe the experience as one of the most revelatory of his life. Though he built models and mechanical devices for fun, he was considered a slow learner, possibly due to dyslexia, simple shyness, or the significantly rare and unusual structure of his brain (examined after his death). 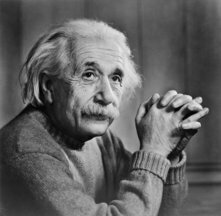 He later credited his development of the theory of relativity to this slowness, saying that by pondering space and time later than most children, he was able to apply a more developed intellect. Another, more recent, theory about his mental development is that he had Asperger's syndrome, a condition related to autism. Einstein attended the Luitpold Gymnasium where he received a relatively progressive education. He began to learn mathematics around age twelve. There is a recurring rumor that he failed mathematics later in his education, but this is untrue; a change in the way grades were assigned caused confusion years later. Two of his uncles fostered his intellectual interests during his late childhood and early adolescence by suggesting and providing books on science, mathematics and philosophy. In 1894, following the failure of Hermann's electrochemical business, the Einsteins moved from Munich to Pavia, Italy (near Milan). During this year, Einstein's first scientific work was written (called "The Investigation of the State of Aether in Magnetic Fields"). Albert remained behind in Munich lodgings to finish school, completing only one term before leaving the gymnasium in spring 1895 to rejoin his family in Pavia. He quit without telling his parents and a year and a half prior to final examinations, Einstein convinced the school to let him go with a medical note from a friendly doctor, but this meant he had no secondary-school certificate. Despite excelling in the mathematics and science portion, his failure of the liberal arts portion of the Eidgenössische Technische Hochschule (ETH, Swiss Federal Institute of Technology, in Zurich) entrance exam the following year was a setback; his family sent him to Aarau, Switzerland, to finish secondary school, where he received his diploma in September 1896. During this time he lodged with Professor Jost Winteler's family and became enamoured with Marie, their daughter, his first sweetheart. Albert's sister Maja was to later marry their son Paul, and his friend Michele Besso married their other daughter Anna. Einstein subsequently enrolled at the Eidgenössische Technische Hochschule in October and moved to Zurich, while Marie moved to Olsberg for a teaching post. The same year, he renounced his Württemberg citizenship and became stateless. In the spring of 1896, the Serbian Mileva Maric (an acquaintance of Nikola Tesla) started initially as a medical student at the University of Zurich, but after a term switched to the same section as Einstein as the only woman that year to study for the same diploma. Einstein's relationship with Mileva developed into romance over the next few years. In 1900, he was granted a teaching diploma by the Eidgenössische Technische Hochschule (ETH Zurich) and was accepted as a Swiss citizen in 1901. He kept his Swiss passport for his whole life. During this time Einstein discussed his scientific interests with a group of close friends, including Mileva. He and Mileva had an illegitimate daughter Lieserl, born in January 1902. Upon graduation, Einstein could not find a teaching post, mostly because his brashness as a young man had apparently irritated most of his professors. The father of a classmate helped him obtain employment as a technical assistant examiner at the Swiss Patent Office  in 1902. There, Einstein judged the worth of inventors' patent applications for devices that required a knowledge of physics to understand. He also learned how to discern the essence of applications despite sometimes poor descriptions, and was taught by the director how "to express myself correctly". He occasionally rectified their design errors while evaluating the practicality of their work. Einstein married Mileva Maric on January 6, 1903. Einstein's marriage to Maric, who was a mathematician, was both a personal and intellectual partnership: Einstein referred to Mileva as "a creature who is my equal and who is as strong and independent as I am". Ronald W. Clark, a biographer of Einstein, claimed that Einstein depended on the distance that existed in his and Mileva's marriage in order to have the solitude necessary to accomplish his work; he required intellectual isolation. Abram Joffe, a Soviet physicist who knew Einstein, in an obituary of Einstein, wrote, "The author of [the papers of 1905] was ... a bureaucrat at the Patent Office in Bern, Einstein-Maric" and this has recently been taken as evidence of a collaborative relationship. However, according to Alberto A. Martínez of the Center for Einstein Studies at Boston University, Joffe only ascribed authorship to Einstein, as he believed that it was a Swiss custom at the time to append the spouse's last name to the husband's name. Whatever the truth, the extent of her influence on Einstein's work is a highly controversial and debated question. On May 14, 1904, the couple's first son, Hans Albert Einstein, was born. In 1904, Einstein's position at the Swiss Patent Office was made permanent. He obtained his doctorate after submitting his thesis "A new determination of molecular dimensions" ("Eine neue Bestimmung der Moleküldimensionen") in 1905. That same year, he wrote four articles that provided the foundation of modern physics, without much scientific literature to which he could refer or many scientific colleagues with whom he could discuss the theories. Most physicists agree that three of those papers (on Brownian motion, the photoelectric effect, and special relativity) deserved Nobel Prizes. Only the paper on the photoelectric effect would win one. This is ironic, not only because Einstein is far better-known for relativity, but also because the photoelectric effect is a quantum phenomenon, and Einstein became somewhat disenchanted with the path quantum theory would take. What makes these papers remarkable is that, in each case, Einstein boldly took an idea from theoretical physics to its logical consequences and managed to explain experimental results that had baffled scientists for decades. Einstein submitted the series of papers to the "Annalen der Physik". They are commonly referred to as the "Annus Mirabilis Papers" (from Annus mirabilis, Latin for 'year of wonders'). The International Union of Pure and Applied Physics (IUPAP) plans to commemorate the 100th year of the publication of Einstein's extensive work in 1905 as the 'World Year of Physics 2005'. The first paper, named "On a Heuristic Viewpoint Concerning the Production and Transformation of Light", ("Über einen die Erzeugung und Verwandlung des Lichtes betreffenden heuristischen Gesichtspunkt") proposed the idea of "energy quanta" (which underlies the concept of what are now called photons) and showed how it could be used to explain such phenomena as the photoelectric effect. This paper was specifically cited for his Nobel Prize. His second article in 1905, named "On the Motion—Required by the Molecular Kinetic Theory of Heat—of Small Particles Suspended in a Stationary Liquid", ("Über die von der molekularkinetischen Theorie der Wärme geforderte Bewegung von in ruhenden Flüssigkeiten suspendierten Teilchen") covered his study of Brownian motion, and provided empirical evidence for the existence of atoms. Einstein's third paper that year, "On the Electrodynamics of Moving Bodies" ("Zur Elektrodynamik bewegter Körper"), was published on June 30, 1905. While developing this paper, Einstein wrote to Mileva about "our work on relative motion", and this has led some to ask whether Mileva played a part in its development. This paper introduced the special theory of relativity, a theory of time, distance, mass and energy which was consistent with electromagnetism, but omitted the force of gravity. A fourth paper, "Does the Inertia of a Body Depend Upon Its Energy Content? ", ("Ist die Trägheit eines Körpers von seinem Energieinhalt abhängig?") published late in 1905, showed one further deduction from relativity's axioms, the famous equation that the energy of a body at rest (E) equals its mass (m) times the speed of light (c) squared. In 1906, Einstein was promoted to technical examiner second class. In 1908, Einstein was licensed in Bern, Switzerland, as a Privatdozent (unsalaried teacher at a university). Einstein's second son, Eduard, was born on July 28, 1910. In 1911, Einstein became first associate professor at the University of Zurich, and shortly afterwards full professor at the (German) University of Prague, only to return the following year to Zurich in order to become full professor at the ETH Zurich. At that time, he worked closely with the mathematician Marcel Grossmann. In 1912, Einstein started to refer to time as the fourth dimension. In 1914, just before the start of World War I, Einstein settled in Berlin as professor at the local university and became a member of the Prussian Academy of Sciences. He took German citizenship. His pacifism and Jewish origins irritated German nationalists. After he became world-famous, nationalistic hatred of him grew and for the first time he was the subject of an organized campaign to discredit his theories. From 1914 to 1933, he served as director of the Kaiser Wilhelm Institute for Physics in Berlin, and it was during this time that he was awarded his Nobel Prize and made his most groundbreaking discoveries. He was also an extraordinary professor at the Leiden University from 1920 till officially 1946, where he regularly gave guest lectures. Einstein divorced Mileva on February 14, 1919, and married his cousin Elsa Löwenthal (born Einstein: Löwenthal was the surname of her first husband, Max) on June 2, 1919. Elsa was Albert's first cousin (maternally) and his second cousin (paternally). She was three years older than Albert, and had nursed him to health after he had suffered a partial nervous breakdown combined with a severe stomach ailment; there were no children from this marriage. The fate of Albert and Mileva's first child, Lieserl, is unknown. Some believe she died in infancy, while others believe she was given out for adoption. They later had two sons: Eduard and Hans Albert. Eduard intended to practice as a Freudian analyst but was institutionalized for schizophrenia and died in an asylum. Hans Albert, his older brother, became a professor of hydraulic engineering at the University of California, Berkeley, having little interaction with his father. In November 1915, Einstein presented a series of lectures before the Prussian Academy of Sciences in which he described his theory of general relativity. The final lecture climaxed with his introduction of an equation that replaced Newton's law of gravity. This theory considered all observers to be equivalent, not only those moving at a uniform speed. In general relativity, gravity is no longer a force (as it is in Newton's law of gravity) but is a consequence of the curvature of space-time. The theory provided the foundation for the study of cosmology and gave scientists the tools for understanding many features of the universe that were discovered well after Einstein's death. A truly revolutionary theory, general relativity has so far passed every test posed to it and has become a powerful tool used in the analysis of many subjects in physics. Initially, scientists were skeptical because the theory was derived by mathematical reasoning and rational analysis, not by experiment or observation. But in 1919, predictions made using the theory were confirmed by Arthur Eddington's measurements (during a solar eclipse), of how much the light emanating from a star was bent by the Sun's gravity when it passed close to the Sun, an effect called gravitational lensing. On November 7, The Times reported the confirmation, cementing Einstein's fame. Many scientists were still unconvinced for various reasons ranging from disagreement with Einstein's interpretation of the experiments, to not being able to tolerate the absence of an absolute frame of reference. In Einstein's view, many of them simply could not understand the mathematics involved. Einstein's public fame which followed the 1919 article created resentment among these scientists some of which lasted well into the 1930s. In the early 1920s Einstein was the lead figure in a famous weekly physics colloquium at the University of Berlin. On March 30, 1921, Einstein went to New York to give a lecture on his new Theory of Relativity, the same year he was awarded the Nobel Prize. Though he is now most famous for his work on relativity, it was for his earlier work on the photoelectric effect that he was given the Prize, as his work on general relativity was still disputed. The Nobel committee decided that citing his less-contested theory in the Prize would gain more acceptance from the scientific community. Einstein's relationship with quantum physics was quite remarkable. He was the first to say that quantum theory was revolutionary. His postulation that light can be described not only as a wave with no kinetic energy, but also as massless discrete packets of energy called quanta with measurable kinetic energy (now known as photons) marked a landmark break with the classical physics. In 1909 Einstein presented his first paper on the quantification of light to a gathering of physicists and told them that they must find some way to understand waves and particles together. In the mid-1920s, as the original quantum theory was replaced with a new theory of quantum mechanics, Einstein balked at the Copenhagen interpretation of the new equations because it settled for a probabilistic, non-visualizable account of physical behaviour. Einstein agreed that the theory was the best available, but he looked for a more "complete" explanation, i.e., more deterministic. He could not abandon the belief that physics described the laws that govern "real things", the belief which had led to his successes with atoms, photons, and gravity. Quantum mechanics is certainly imposing. But an inner voice tells me it is not yet the real thing. The theory says a lot, but does not really bring us any closer to the secret of the Old One. I, at any rate, am convinced that He does not throw dice. To this, Bohr, who sparred with Einstein on quantum theory, retorted, "Stop telling God what He must do!" The Bohr-Einstein debates on foundational aspects of quantum mechanics happened during the Solvay conferences. Einstein was not rejecting probabilistic theories per se. Einstein himself was a great statistician, using statistical analysis in his works on Brownian motion and photoelectricity and in papers published before the miraculous year 1905; Einstein had even discovered Gibbs ensembles. However, he believed that, at the core, physical reality behaved deterministically. Many physicists argue that experimental evidence contradicting this belief was found much later with the discovery of Bell's Theorem and Bell's inequality. However, there is still space for lively discussions about the interpretation of quantum mechanics. Einstein also assisted Erwin Schrödinger in the development of the quantum Boltzmann distribution, a mixed classical and quantum mechanical gas model although he realized that this was less significant than the Bose-Einstein model and declined to have his name included on the paper. Einstein and Szilárd's refrigerator patent diagram.Einstein and former student Leó Szilárd co-invented a unique type of refrigerator (usually called the Einstein refrigerator) in 1926. On November 11, 1930, U.S. Patent 1,781,541 was awarded to Albert Einstein and Leó Szilárd. The patent covered a thermodynamic refrigeration cycle providing cooling with no moving parts, at a constant pressure, with only heat as an input. The refrigeration cycle used ammonia, butane, and water. After Adolf Hitler came to power in 1933, expressions of hatred for Einstein reached new levels. He was accused by the National Socialist regime of creating "Jewish physics" in contrast with Deutsche Physik—"German" or "Aryan physics". Nazi physicists (notably including the Nobel laureates Johannes Stark and Philipp Lenard) continued the attempts to discredit his theories and to blacklist politically those German physicists who taught them (such as Werner Heisenberg). Einstein renounced his German citizenship and fled to the United States, where he was given permanent residency. He accepted a position at the newly founded Institute for Advanced Study in Princeton Township, New Jersey. He became an American citizen in 1940, though he still retained Swiss citizenship. In 1939, under the encouragement of Szilárd, Einstein sent a letter to President Franklin Delano Roosevelt urging the study of nuclear fission for military purposes, under fears that the Nazi government would be first to develop atomic weapons. Roosevelt started a small investigation into the matter which eventually became the massive Manhattan Project. His work at the Institute for Advanced Study focused on the unification of the laws of physics, which he referred to as the Unified Field Theory. He attempted to construct a model which would describe all of the fundamental forces as different manifestations of a single force. His attempt was hindered because the strong and weak nuclear forces were not understood independently until around 1970, fifteen years after Einstein's death. Einstein's goal of unifying the laws of physics under a single model survives in the current drive for unification of the forces, embodied most notably by string theory. Einstein began to form a generalized theory of gravitation with the Universal Law of Gravitation and the electromagnetic force in his first attempt to demonstrate the unification and simplification of the fundamental forces. In 1950 he described his work in a Scientific American article. Einstein was guided by a belief in a single statistical measure of variance for the entire set of physical laws. Einstein's Generalized Theory of Gravitation is a universal mathematical approach to field theory. He investigated reducing the different phenomena by the process of logic to something already known or evident. Einstein tried to unify gravity and electromagnetism in a way that also led to a new subtle understanding of quantum mechanics. Einstein postulated a four-dimensional space-time continuum expressed in axioms represented by five component vectors. Particles appear in his research as a limited region in space in which the field strength or the energy density are particularly high. Einstein treated subatomic particles as objects embedded in the unified field, influencing it and existing as an essential constituent of the unified field but not of it. Einstein also investigated a natural generalization of symmetrical tensor fields, treating the combination of two parts of the field as being a natural procedure of the total field and not the symmetrical and antisymmetrical parts separately. He researched a way to delineate the equations and systems to be derived from a variational principle. Einstein became increasingly isolated in his research on a generalized theory of gravitation and was ultimately unsuccessful in his attempts. In 1948, Einstein served on the original committee which resulted in the founding of Brandeis University. A portrait of Einstein was taken by Yousuf Karsh on February 11 of that same year. In 1952, the Israeli government proposed to Einstein that he take the post of second president. He declined the offer, and remains the only United States citizen ever to be offered a position as a foreign head of state. On March 30, 1953, Einstein released a revised unified field theory. He died at a hospital in Princeton, New Jersey, on April 18, 1955, leaving the Generalized Theory of Gravitation unsolved. The only person present at his deathbed, a hospital nurse, said that just before his death he mumbled several words in German that she did not understand. He was cremated without ceremony on the same day he died at Trenton, New Jersey, in accordance with his wishes. His ashes were scattered at an undisclosed location. His brain was preserved by Dr. Thomas Stoltz Harvey, the pathologist who performed the autopsy on Einstein. Harvey found nothing unusual with his brain, but in 1999 further analysis by a team at McMaster University revealed that his parietal operculum region was missing and, to compensate, his inferior parietal lobe was 15% wider than normal . The inferior parietal region is responsible for mathematical thought, visuospatial cognition, and imagery of movement. Einstein's brain also contained 73% more glial cells than the average brain. Albert Einstein was much respected for his kind and friendly demeanor rooted in his pacifism. He was modest about his abilities, and had distinctive attitudes and fashions—for example, he minimized his wardrobe so that he would not need to waste time in deciding on what to wear. He occasionally had a playful sense of humor, and enjoyed sailing and playing the violin. He was also the stereotypical "absent-minded professor"; he was often forgetful of everyday items, such as keys, and would focus so intently on solving physics problems that he would often become oblivious to his surroundings. Although he was raised Jewish, he was not a believer in Judaism. He simply admired the beauty of nature and the universe. From a letter written in English, dated March 24, 1954, Einstein wrote, "It was, of course, a lie what you read about my religious convictions, a lie which is being systematically repeated. I do not believe in a personal God and I have never denied this but have expressed it clearly. If something is in me which can be called religious then it is the unbounded admiration for the structure of the world so far as our science can reveal it." He also said (in an essay reprinted in Living Philosophies, vol. 13 (1931)): "A knowledge of the existence of something we cannot penetrate, our perceptions of the profoundest reason and the most radiant beauty, which only in their most primitive forms are accessible to our minds - it is this knowledge and this emotion that constitute true religiosity; in this sense, and this [sense] alone, I am a deeply religious man." The following is a response made to Rabbi Herbert Goldstein of the International Synagogue in New York which read, "I believe in Spinoza's God who reveals himself in the orderly harmony of what exists, not in a God who concerns himself with the fates and actions of human beings." After being pressed on his religious views by Martin Buber, Einstein exclaimed, "What we [physicists] strive for is just to draw His lines after Him." Summarizing his religious beliefs, he once said: "My religion consists of a humble admiration of the illimitable superior spirit who reveals himself in the slight details we are able to perceive with our frail and feeble mind." He also expressed admiration for Buddhism, which he said "has the characteristics of what would be expected in a cosmic religion for the future: It transcends a personal God, avoids dogmas and theology; it covers both the natural and the spiritual, and it is based on a religious sense aspiring from the experience of all things, natural and spiritual, as a meaningful unity." Victor J. Stenger, author of Has Science Found God? (2001), wrote of Einstein's presumed pantheism, "Both deism and traditional Judeo-Christian-Islamic theism must also be contrasted with pantheism, the notion attributed to Baruch Spinoza that the deity is associated with the order of nature or the universe itself. This also crudely summarizes the Hindu view and that of many indigenous religions around the world. When modern scientists such as Einstein and Stephen Hawking mention 'God' in their writings, this is what they seem to mean: that God is Nature." Einstein was an Honorary Associate of the Rationalist Press Association from 1934. Einstein considered himself a pacifist and humanitarian, and in later years, a committed democratic socialist. He once said, "I believe Gandhi's views were the most enlightened of all the political men of our time. We should strive to do things in his spirit: not to use violence for fighting for our cause, but by non-participation of anything you believe is evil." Einstein's views on other issues, including socialism, McCarthyism and racism, were controversial (see Einstein on socialism). Einstein was a co-founder of the liberal German Democratic Party. The U.S. FBI kept a 1,427 page file on his activities and recommended that he be barred from immigrating to the United States under the Alien Exclusion Act, alleging that Einstein "believes in, advises, advocates, or teaches a doctrine which, in a legal sense, as held by the courts in other cases, 'would allow anarchy to stalk in unmolested' and result in 'government in name only'", among other charges. They also alleged that Einstein "was a member, sponsor, or affiliated with thirty-four communist fronts between 1937-1954" and "also served as honorary chairman for three communist organizations." It should be noted that many of these documents were submitted to the FBI, mainly by civilian political groups, and not actually written by FBI officials. Einstein opposed tyrannical forms of government, and for this reason (and his Jewish background), opposed the Nazi regime and fled Germany shortly after it came to power. He initially favored construction of the atomic bomb, in order to ensure that Hitler did not do so first, and even sent a letter to President Roosevelt (dated August 2, 1939, before World War II broke out, and likely authored by Leó Szilárd) encouraging him to initiate a program to create a nuclear weapon. Roosevelt responded to this by setting up a committee for the investigation of using uranium as a weapon, which in a few years was superseded by the Manhattan Project. After the war, though, Einstein lobbied for nuclear disarmament and a world government: "I know not with what weapons World War III will be fought, but World War IV will be fought with sticks and stones." Einstein was a supporter of Zionism. He supported Jewish settlement of the ancient seat of Judaism and was active in the establishment of the Hebrew University in Jerusalem, which published (1930) a volume titled About Zionism: Speeches and Lectures by Professor Albert Einstein, and to which Einstein bequeathed his papers. However, he opposed nationalism and expressed skepticism about whether a Jewish nation-state was the best solution. He may have imagined Jews and Arabs living peacefully in the same land. In later life, in 1952, he was offered the post of second president of the newly created state of Israel, but declined the offer, claiming that he lacked the necessary people skills. Thank you for your letter of April 5. I am gladly willing to sign your excellent statement. I also agree with your choice of the prospective signers.